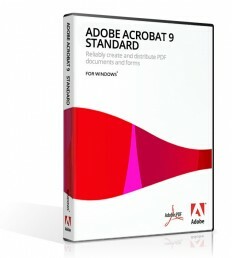 Description Adobe Systems Acrobat Standard 9.0 for Windows Create and reliably share PDF documents. Combine files from multiple applications in a single PDF file. Easily create fillable PDF forms to collect data electronically. And apply basic document security features. Features: * Reliably share documents: Create and distribute PDF files that preserve the formatting of the originals. Combine documents, email, images, spreadsheets, and web pages in a single PDF file. Quickly organize content and add polish tocommunicate clearly and effectively. Share information with virtually anyone using free Adobe Reader software. * Quickly create forms: Use the new Form Wizard to create forms from paper or electronic documents. Scan or convert existing documentsto PDF forms that can be filled in electronically, ensuring the data you receive is accurate and useful. Use the Form Tracker to see when forms have been completed and who has completed them. Easily export form data to a spreadsheet for analysis andreporting. * Easily exchange feedback: Efficiently review documents and provide input with familiar commenting tools. Quickly gain the input you need to efficiently develop and complete work. Witheasy-to-manage electronic reviews, participants can see and build on other reviewers comments as they are being made. * Help protect sensitive information: Control access to PDF files with document passwords and permissions. Set document permissions to define whether a file can be printed or changed. Apply passwords to help restrict document access. Digitally sign and certify documents to validate they came from a trusted source. Get time back on your side with PDF forms Scan or upload any static form, and it will be transformed into a PDF form, complete with interactive fiels. Easily cusomize your files with pull-down menus or radial buttons and e-mail them to virtually anyone, anywhere. Data is automatically stored in one place for analysis to save time and avoid mistakes. Create and reliably share PDF documents Easily convert any document that prints to PDF to preserve formatting and help ensure document integrity. Combine content in a single PDF file Assemble documents, spreadsheets, presentations, e-mail, and web pages in a single compressed PDF file to easily share with others. Help protect your documents Password-protect files, set permissions to control changes, even permanently remove sensitive information and metadata to protect the authenticity of critical documents. Easily create and track PDF forms Convert Microsoft Word and Excel documents or scanned paper to PDF forms. Form fields are automatically recognized and converted to fillable fields. Use the Form Tracker to see when forms have been completed and who has completed them. Easily export data to a spreadsheet for analysis and reporting. Easily review documents Use familiar commenting tools--such as sticky notes, a highlighter, and stamps--to provide feedback. Comments can be sorted by author, date, or page. Sign documents digitally Use digital signatures to approve documents, which helps eliminate the costly and time consuming practice of printing, signing, and faxing. Convert paper documents to PDF Easily scan a paper document and convert it to a searchable PDF file. Convert from PDF to Microsoft Word Save PDF files as Word documents, retaining the layout, fonts, formatting, and tables, so you can easily reuse content. Archive documents and e-mail Save documents and e-mail in PDF/A, the standard for archiving, to simplify search and retrieval in the future. Deliver a compelling branded experience using PDF Portfolios Bring multiple files together in a single organized and interactive PDF Portfolio. Use professionally designed templates that can be branded with your logo and include descriptions to guide recipients through the contents. Help protect your documents Use passwords to control access to PDF documents. Use permissions to restrict printing, copying, or altering. Save passwords and permissions as security policies that can be easily applied to new PDF files. Easily create and manage electronic forms Build dynamic forms, distribute and track forms and responses, and easily export data for analysis and reporting. Manage and track electronic document reviews Gain the input you need through interactive document reviews that enable participants to see and build on other reviewers' comments, which can be sorted by author, date, or page. Use the Form Tracker to monitor progress and participation. Include Adobe Reader users Enable users of free Adobe Reader software to digitally sign documents, participate in shared document reviews, and save forms locally. By extending Acrobat functionality to Reader users, virtually anyone can participate in the workflows you initiate. Synchronize document views Provide clarity and enhance discussion by e-mailing a PDF document and walking recipients through it in real time by controlling the exact page view they see. Remove sensitive information Use redaction tools to black out sensitive text, illustrations, or other information, permanently deleting the content from the PDF document. Inspect PDF documents for metadata, hidden layers, and other concealed information, and remove before distributing to others. Compare PDF documents Automatically highlight the differences between two versions of a PDF document, including text and images, so you can quickly and easily identify what has changed. Improve print processes Help control costs and reduce errors with automated output controls to preview, preflight, correct, and prepare PDF files for high-end print production and digital publishing. Create and validate accessible PDF documents Ensure your PDF documents are optimized for people with disabilities. Quickly evaluate, correct, and automatically tag PDF documents for optimized accessibility and reflow.